This volume is unlike most of the other Adam volumes in its binding of mottled calf; it also has a contemporary label, 'Diuer. Dessi', presumably a version of diversi designi. The paper on which the drawings are mounted has a watermark frequently found in the Italian volumes of the Adam collection: a fleur de lys within a circle. The drawings themselves have a variety of watermarks. The description of the contents is on a separate sheet fixed to the inside cover and is in ink in a later eighteenth-century hand. The contents correspond to the six sections into which the volume is divided; a seventh section of rough sketches has been added, probably in the slightly later hand of George Bailey and possibly to fill the blank pages of the volume. 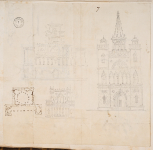 At that time, presumably in the late 1830s, Bailey also noted the drawings that were missing from the original sections.Series 4: there were 15 drawings in the section entitled Gothic Sketches.Series 5: there were originally 20 drawings in the small section described as Landskip Sketches in the index to the volume, of which only 12 remain. Design showing an altarpiece with large consoles joined by a swag with a relief panel above and part of a capriccio of landscape and buildings flanked by two standing figures. Capriccio showing the façade of a church with three spires on top of heavily decorated towers, with a central rose window above an arcade with apsidal doorway. Italy: Florence, Florence Cathedral and Uffizi: detail of elevation and section of balustrading in four tiers from the cathedral; cornice detail from the Uffizi.